Just finished Xmas day with the family and itching to get back to some sewing. I had a great time opening my Santa Sack gifts from Sue in Canada. 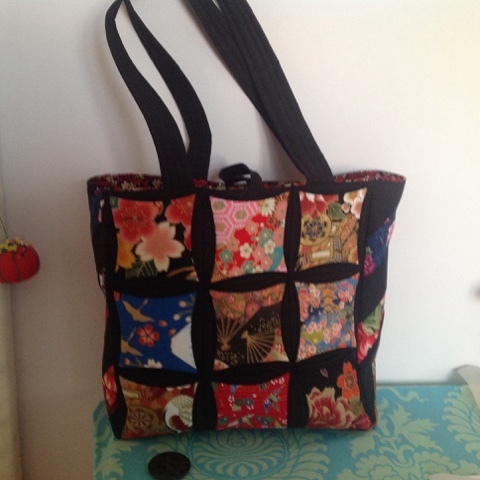 The knitting bag will be so useful to have by me in the lounge when stitching or knitting and the scrap bin is even better for catching up all those stray threads! There is a cute thimble keeper and pin cushion and pins plus a mug rug and some lovely flavoured coffee. The tissue cover is already in use in our guest bedroom. Sue has recieved her parcel and seems pleased with the things I sent her. 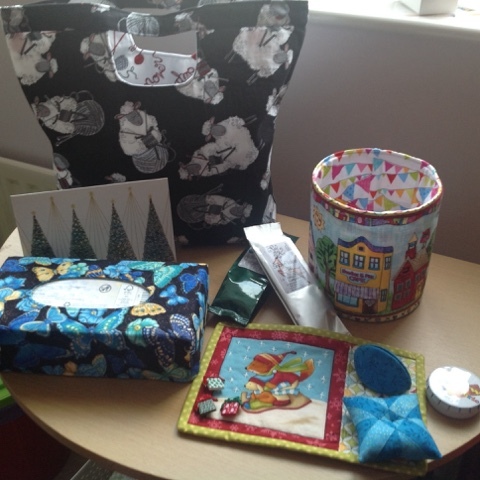 This is about the 6th year I have joined this swap arranged by Cheryll and I just saw love the joy of having some special sewing related gifts to open. 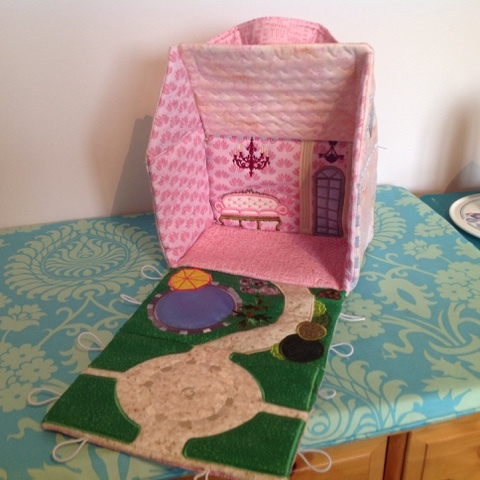 I can also show some of the things I have made recently which were Xmas presents- including the dolls house for my little niece and the Santa mug rug. Well it's back to the mince pies and a good book until I can get to my machine again. 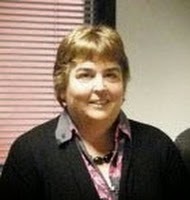 Hi there - long time since I last posted but life has been very busy. I returned from our latest Quilt Retreat feeling very disatisfied with what I had NOT achieved - I find it so difficult to settle on one project but take too many with me and then spend a lot of time talking and helping others. But I still enjoyed it! 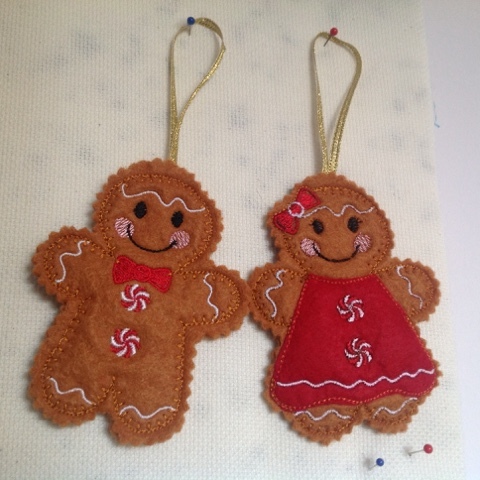 I took my new smaller embroidery machine which I bought to take away with me and made some ginger bread people which were for another group member's Xmas charity craft sale. So I have made some more since I got back as I think they will be popular. 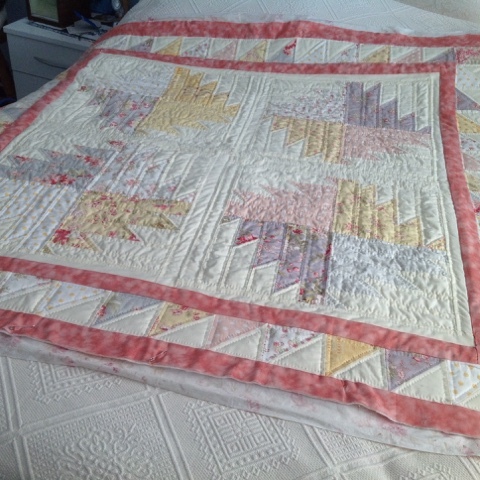 I managed to put together one of two charity quilts I making at the moment with paper-pierced Dresden fans but I still need to add a zigzag border. 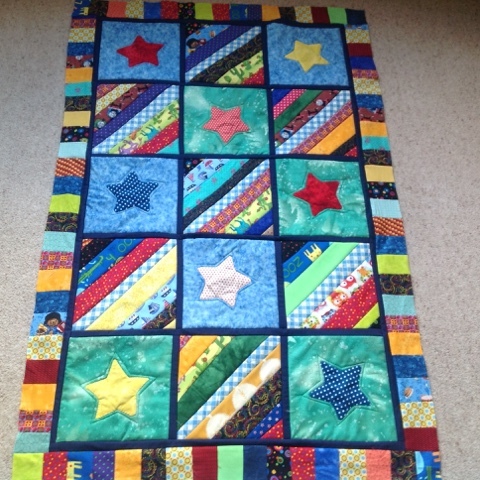 The other one is a scrappy strip quilt which I am really pleased with although it seems that the more strips quilts I make the more strips I seem to accumulate! I have talked before about spending more time on Facebook these days and it's is a wonderful place for ideas and patterns but I also joined a pen pal group and now have a new friend in Australia - Trish who is a very skilled crafter and makes some wonderful things. 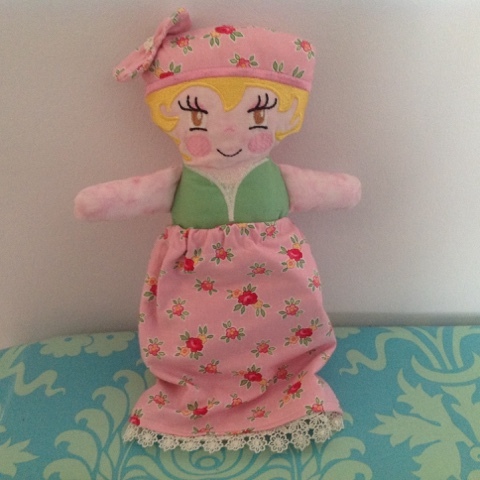 The aim of swapping overseas is that you get to meet someone and learn about their country and I am trying to send Trish items which I put together from places I visit when we are away in our caravan. I have sent her two so far - one with Lake District inspired items such as Kendal Mint Cake and another one from Yorkshire. I have also agreed to send her some Liberty fabric each month as she would like to try using it in a quilt. 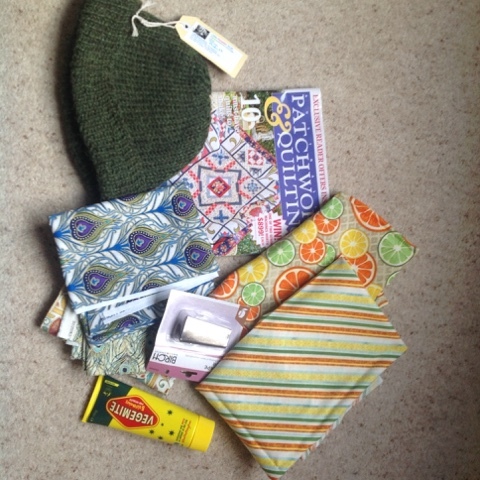 She has sent me some lovely gifts including some Aussie fabric, a copy of my favourite quilting magazine and treats such as Veggimite !! One of the other trending makes on Facebook is the 3 d Xmas table centre. 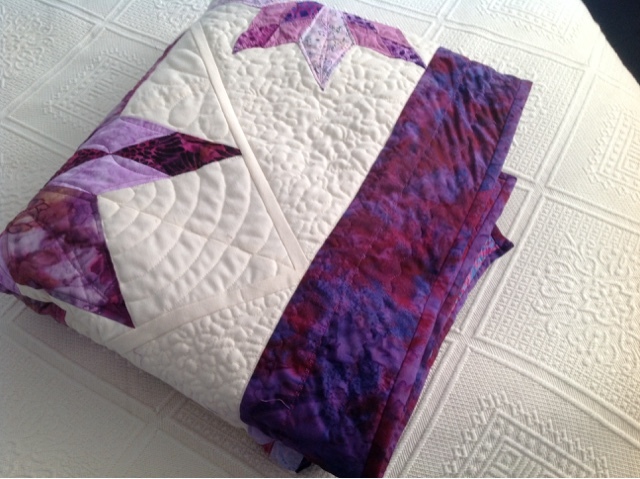 By following various posts and Utube videos I have written up a pattern our next quilt group next week so I have made one to try out the pattern. They are really easy to make once you get the sewing lines in the right place and I intend making one in black and white Xmas fabric for my friend as a Xmas surprise. 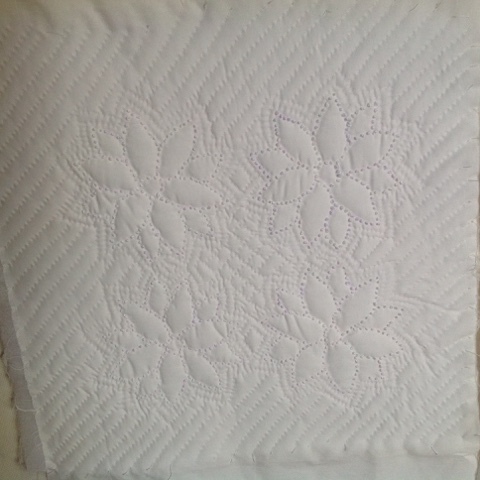 Other things I have been doing are some hand quilting projects I picked up at the Harrogate Quilt show from Sandi Lush. 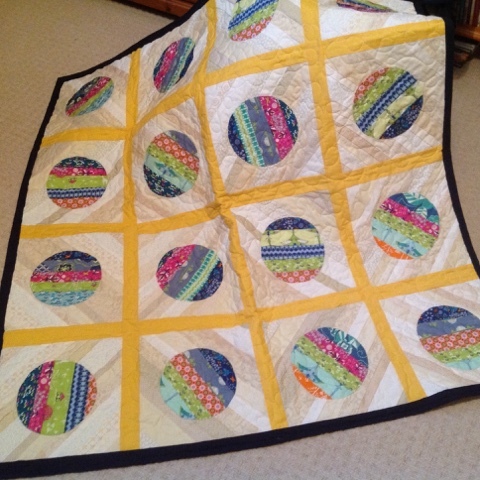 This is the first proper hand quilting I have done and I'm tempted to do more - even a whole block by block quilt. At the moment these are destined to become cushions. 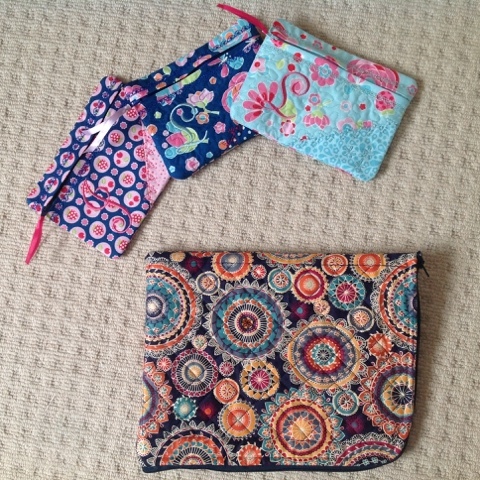 Finally these were some small bags and an IPad case I made for another friend for her granddaughters for Xmas. 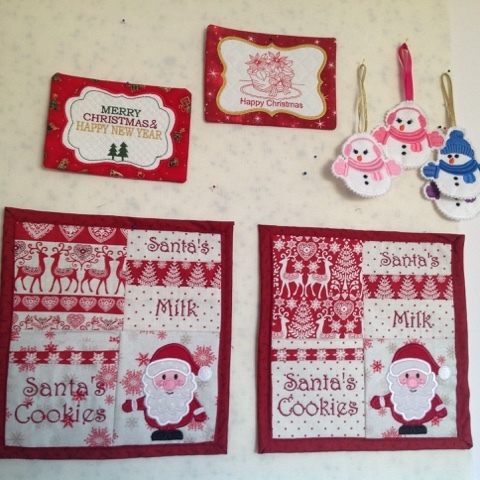 So once again I have been pleased to see what I have managed to get done and I now have the challenge of trying to get Xmas projects completed for both my pen pal Trish and also my Santa sack swap partner Sue in Canada. So I think the machine will be humming!!!! What you can find in a Pound shop!! Why is a coat rack useful for machine embroidery??????? 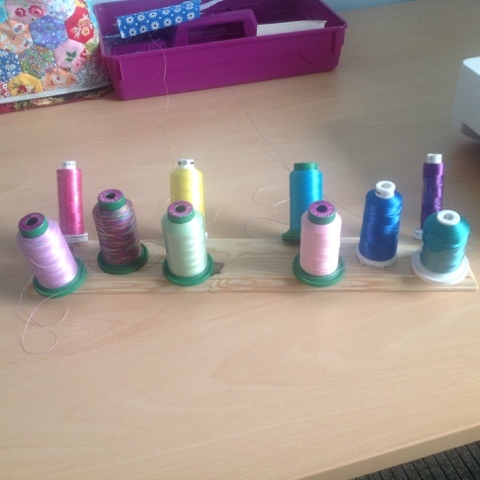 When embroidering a pattern with many colour changes I often mused as to why I could not find a stand for thread other than the very expensive ones made to fit my machine. Although these were custom made I found that reaching up to constantly re thread between colour changes played havoc with my shoulders. 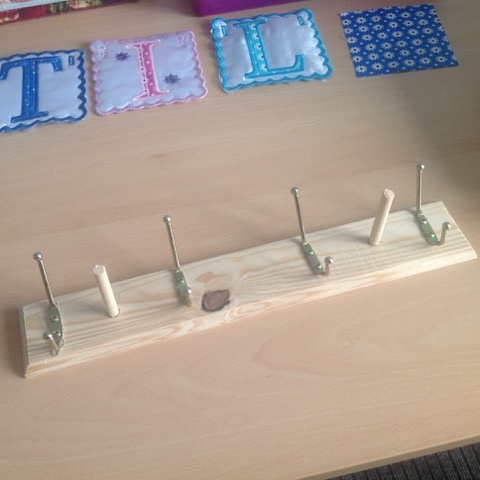 So I decided that what was needed was a row of dowel pegs sunk into a short piece of wood to organise the threads and keep them tidy. So what did I find while wandering the aisle in a new Pound Shop in town? I added a couple of spare bits of dowel to the holes and glued them in place and Viola!! It holds a variety of 10 threads from different manufacturers and sits down the side or in front of my machine while working. It has transformed my life - as they say!!!! 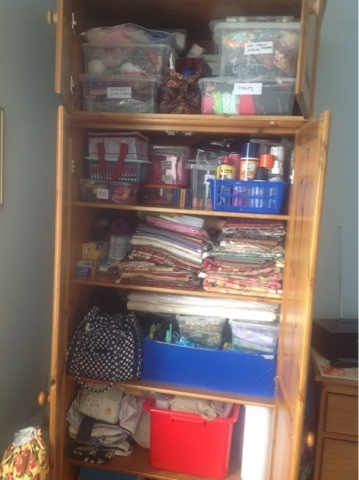 I have been re- organising the storage in my sewing room before I disappeared under a mountain of fabric and UFO's so we bought a new tall oak bookcase and my DH has fitted shelves in the wardrobe and a top box so I know have a lovely oraganised cupboard instead of a wardrobe stuffed with plastic crates. 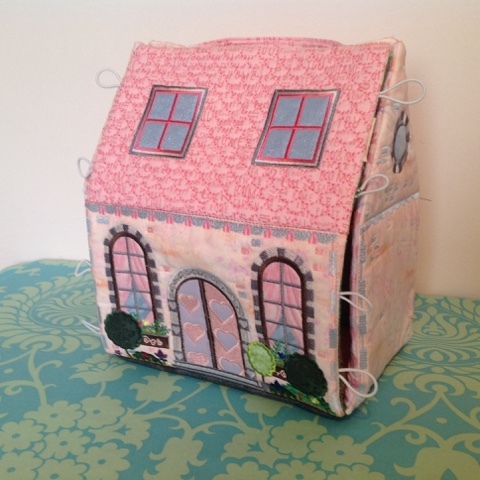 But the down side has been I have not been able to get in to do any sewing for over two weeks! But today it was all finished so I have starting a bunting for my little niece who has just moved into a new house after my brother got a new job in Edinburgh. You can see the first three letters in the top photo -- it is from Sweetpea designs and will also have a lovely owl at either end. So need to get on and get it finished. We recently spent a few days at Scarborough and had fairly pleasant weather but also went to a Quilt Show at Whitby while we were away. It's always nice to see what other people are doing and there were a couple of traders, who all seemed to have a range of Xmas items so I was tempted and bought a couple of things to start making for Xmas. 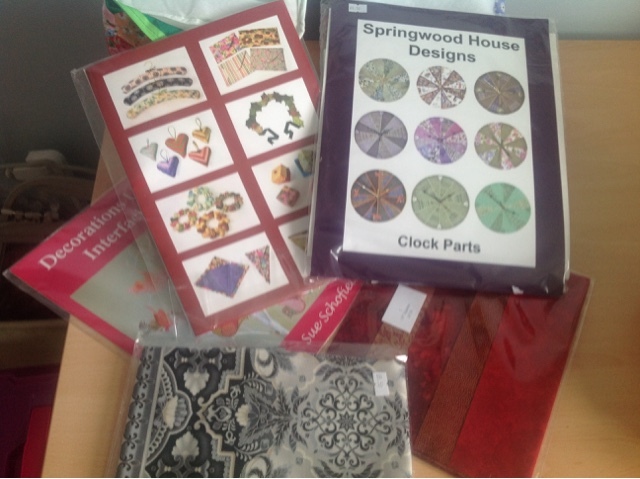 One of the items is a clock kit which I have been looking for and I intend to embroider the circle for the front rather than make a patchwork front, I'm just not sure what design to use yet. 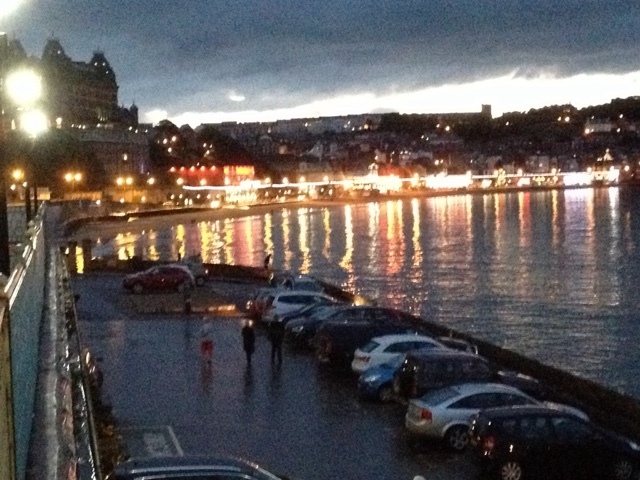 We went out to a couple of evening events and the view across the bay when we came out of the theatre was breathtaking. It had been raining but had stopped and the reflections were so beautiful. Well back to the machine to get the bunting finished. 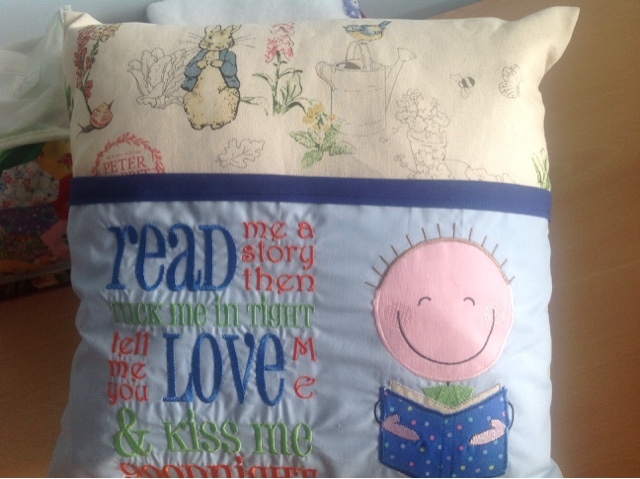 One thing I did get finished was the Peter Rabbit reading cushion I have made for a friend for her grandson. their trip as a memento so I hope they like it. 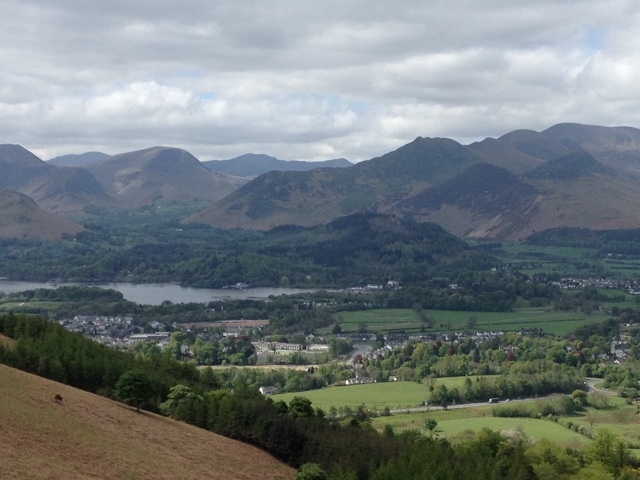 Lovely Lakes- and a mistake! It's that time of the year when we try to get away in our caravan as often as we can. 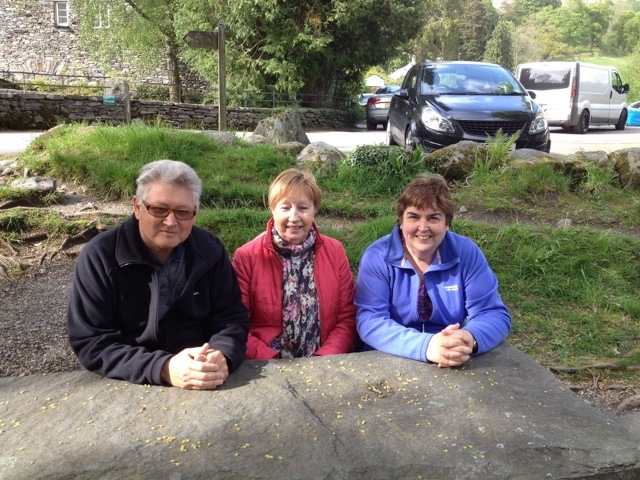 We are back from a great nine days in the Lake District - lots of lovely sunny weather and a great time with our friends. But it's been an unsettled bank holiday in the Uk this weekend so the best place has been in my sewing room and I have been busy machine embroidering cushions. This is for a friend's 4 year old great grandchild who has had an operation and is recovering. 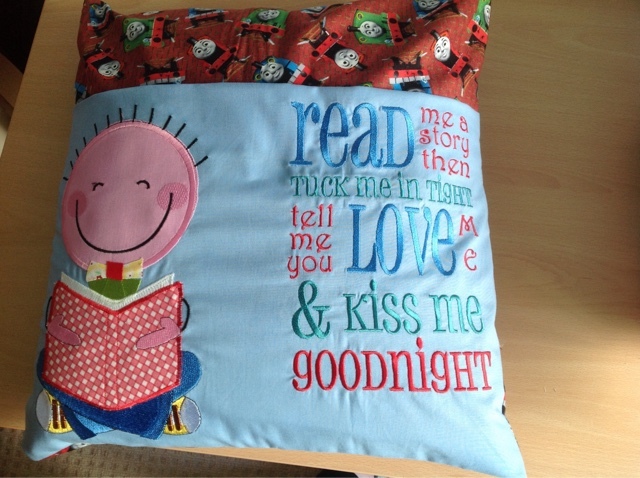 He is a very active little boy and she thinks it will be difficult to get him to rest and not rushing about so I thought this reading cushion might be appropriate and help him to sit still! I then decided to make my niece one as she us hopefully coming to visit in a few days - she is just a year old and has just started walking. 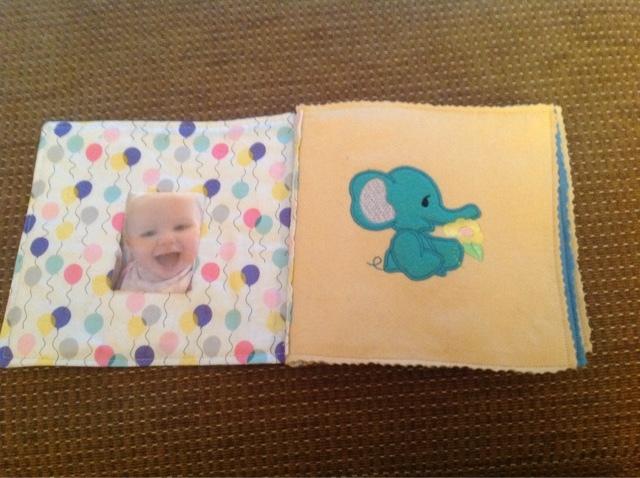 I made her a felt book to go with it. 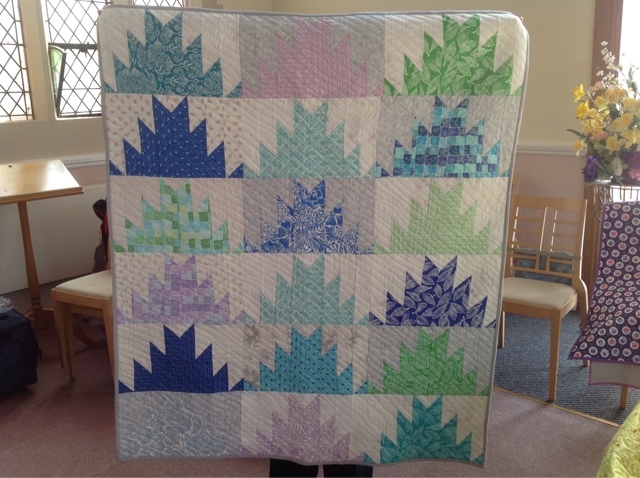 I recently finished the Mountain Majesty quilt and it is ready to be posted off with another 7 quilts from our quilt group to the Siblings Together charity which we support. 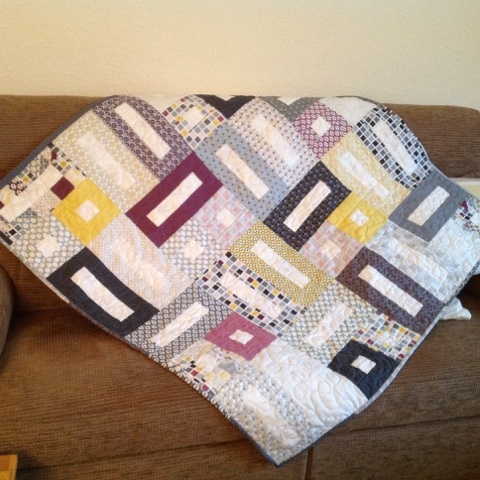 I also made another twister quilt using just one charm pack and some white using the small template and I like this size with the white borders. 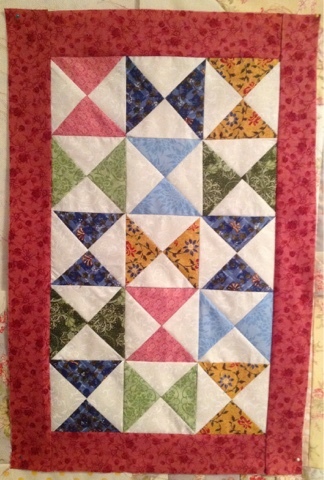 Just needs quilting - along with another 3 or 4! I bought a John Flynn quilt frame off someone on Facebook and excitedly bought all the extras needed to get it put together - the drain pipes and metal piping. I thought from watching the Utube videos it would be easier on my shoulders BUT I cannot say it has been a success - I don't like the very narrow area which can be worked on at anyone time and I don't think either of my machines are really suitable and purchasing another machine is not an option at the moment. 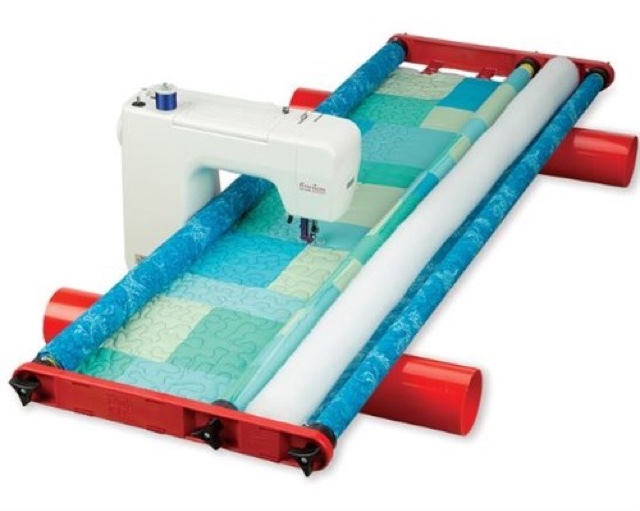 So I think it will be back to free motion quilting and also using my embroidery machine to guilt. It turned out that a lot of the reviewers online had a similar experience to mine. I'm sure for some people it works but it was not for me. It's back in the box and I'm thinking of putting it on EBay! 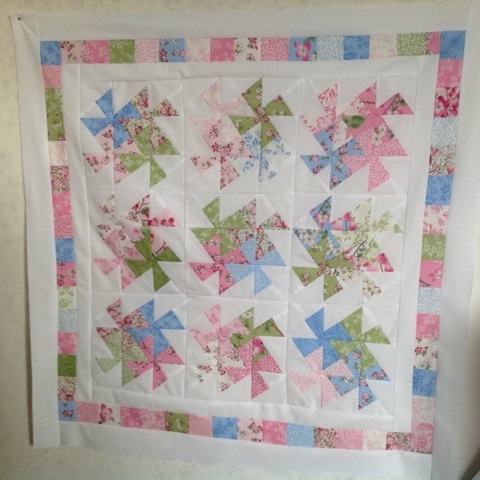 So I will continue to dream about a long arm quilt frame if only I had room ( and the money!) for one. 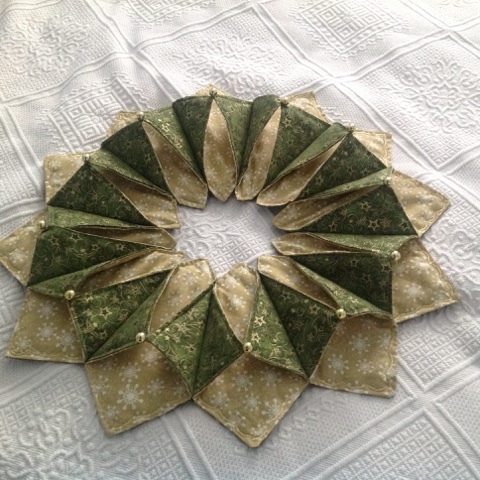 Another quick make has been this needle saver. I regularly change my machine needles depending upon the task but it's hard remembering which one you are using so this is a great little aid. You Insert the needles in when you have taken them out of the machine and changed them. I can see that this will make a nice swop gift as well. 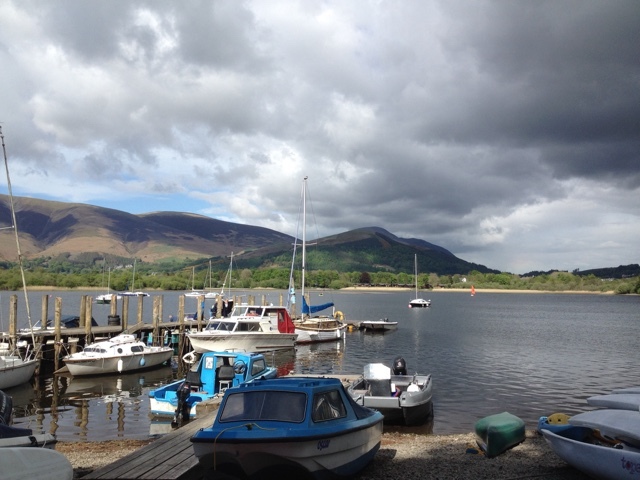 So lots of catching up before we are off again to a new part of the country for out next trip- and of course I have already found out about a mill shop that sells Liberty Fabric cheaply! After a very wet and windy Easter we are getting ready for the first trip of the year in our caravan to Northumberland. 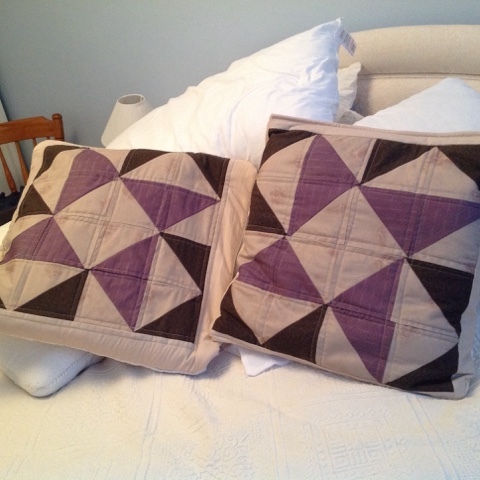 I have made us a couple of quillows over the last two weeks - one of which uses the latest apple core I have just finished hand quilting. While on our recent ill fated weekend retreat during which 7 of the group including me went down with a vicious bug I started a new quilt using a very modern jelly roll I had bought on a trip to the very lovely Scarborough Sewing shop but managed to get very little done as I spent the Sunday in bed ill. So I decided to get on with it and make it for my dear friend who we meet up with on our trips away in the caravan. We have been friends for over 20 years and I just know she will like this as it is very much the style and colours she loves. And we may need it this weekend if the weather forecast is correct! 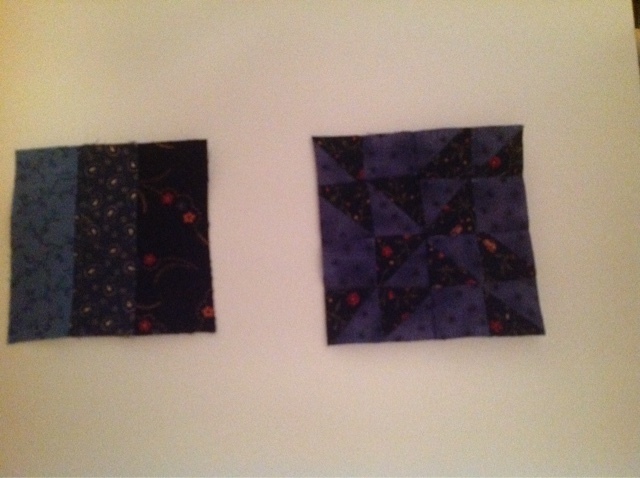 As I had done with mine I added a block to the back to turn it into a quillow so that she can use it as a cushion. 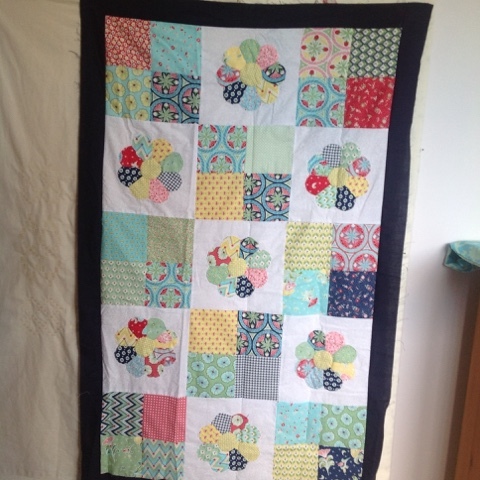 I also finished off a small baby quilt for a neighbour who is about to gain a new grandchild so I wanted ready for when "it" arrives. 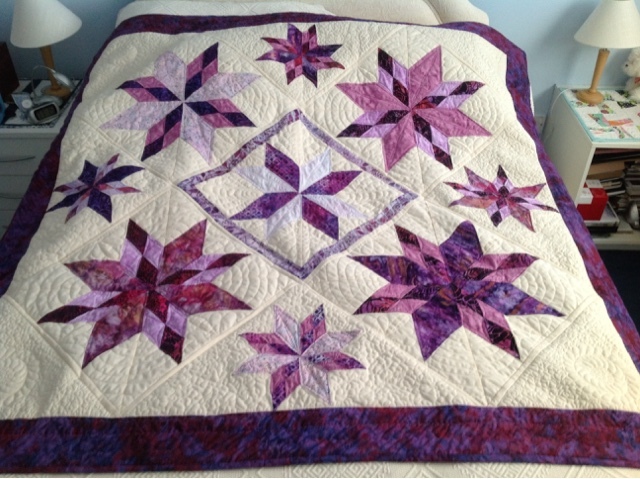 I am still keeping up- just - with the Craftsy block of the month but need to get this latest round completed soon. My son is now half way through his trip to south and North America and is sending us some wonderful photos of the adventures. 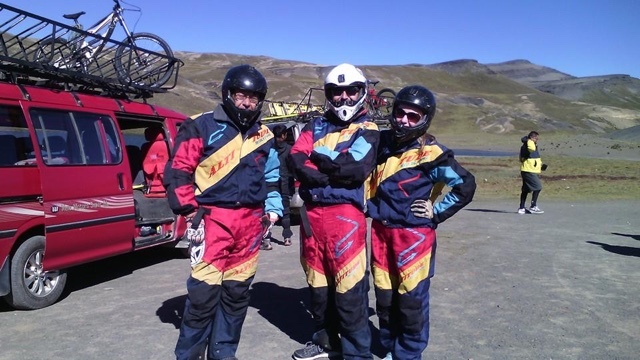 This is them getting ready for a bike trip down the Death Road in Bolivia! 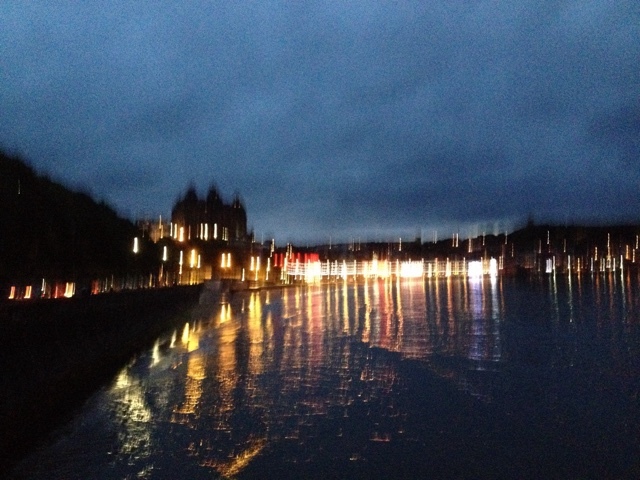 He sends me the photos after they have completed each daring adventure and then let's me know what they have been up to! Only 3 months to go until they get back. So looking forward to a short trip and a chance to catch up with our friends so need to sort some hand sewing incase I find a few minutes ! 6 weeks of 2016 gone! I have been very lax in posting but have been beetling away in the background to keep busy despite having a nasty flu bug which laid me low for a couple of days. 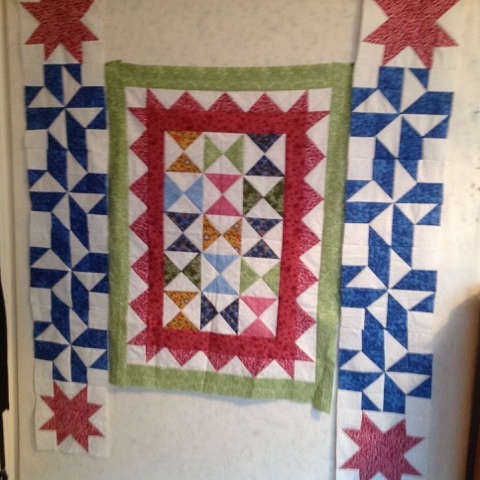 I have failed miserably with the 365 Block a Day project and stopped after 2 weeks as I just did not like the smallness of the blocks but I am enjoying the Craftsy BOM. I have also been on Facebook a lot!!!!! It's very addictive because it is so quick and there is so much to see on the two groups I have signed up for. 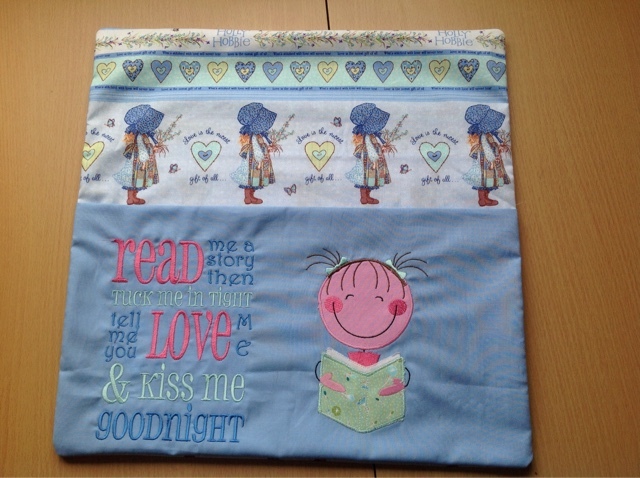 UK Quilters is a great group and I have also signed up to Helping Hearts which lists all the charity projects who are looking for lap quilts and other items. 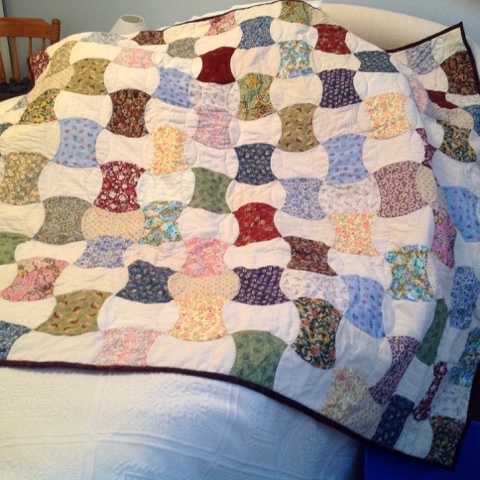 So I am planning on making more charity lap quilts instead of large quilts which I don't have a home for. 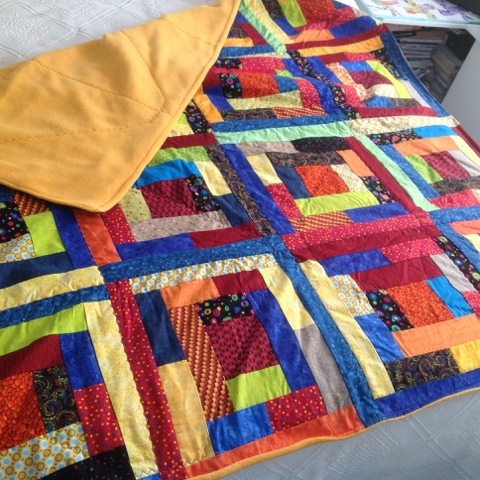 I have finished a large colourful quilt and a smaller scrappy quilt for SIBLings Together which is looking for 100 quilts this year for their summer camps. 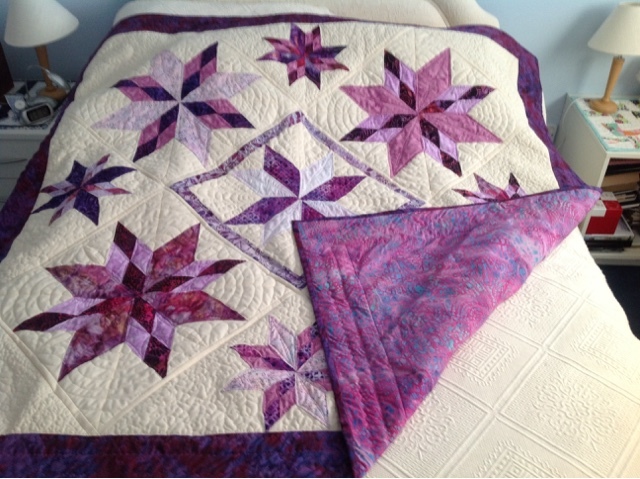 The smaller quilt is from Nancy Zeiman's block of the months this year. This was a great way to use up strings but with a different end result. 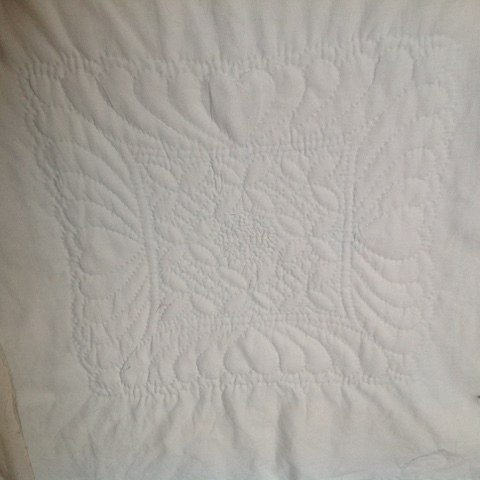 I have also been hand quilting a whole quilt which is a first for me but it's been great to sit and Sew Slowly! This is from a Craftsy lesson by Beverly Eimo and is the Buzz Saw block. I used the Whitewashed Cottage fabric as I bought both a jelly roll and a layer cake last year BUT I fell out of love with it as I thought it looked a bit wishy- washy but I now think it has worked well with the peach accent colour to set it off. It just need binding. 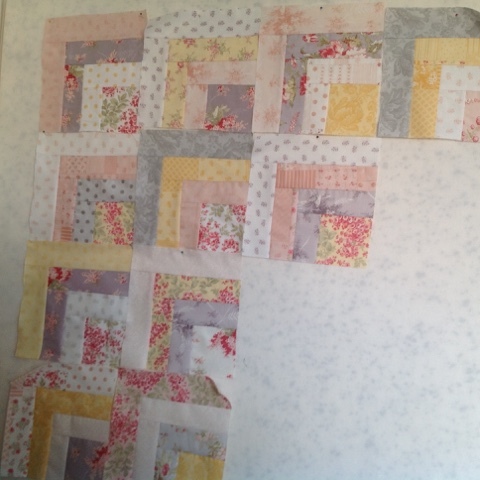 I had enough left to make another quilt so I am looking to making a 1/4 log cabin Block from this months Quilting for You magazine. 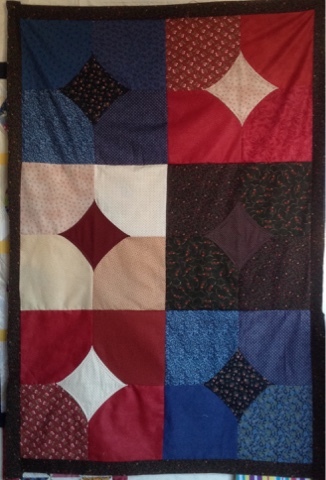 I also put together a 10 minute Block Quilt from some lovely Moda layer cakes I had in dark reds and blues. As usual I end up with lots of tops completed but struggle to find backing fabric at a reasonable price to get them quilted and finished. 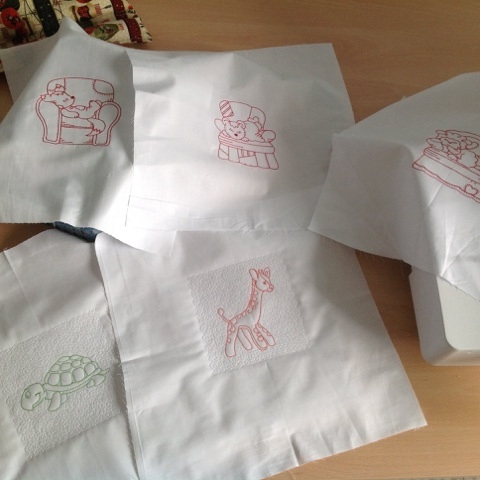 As the year passes we are all looking forward to our next quilt retreat at Cober Hill in only 2 weeks time so I am desperately try to prep some projects to take with me and decided some embroidered blocks ready to turn into baby quilts would be a good idea. One is a Couch Potatoes Pets design and the other Zoo animals - both from my favourite embroidery designer Kiwi Kreations. 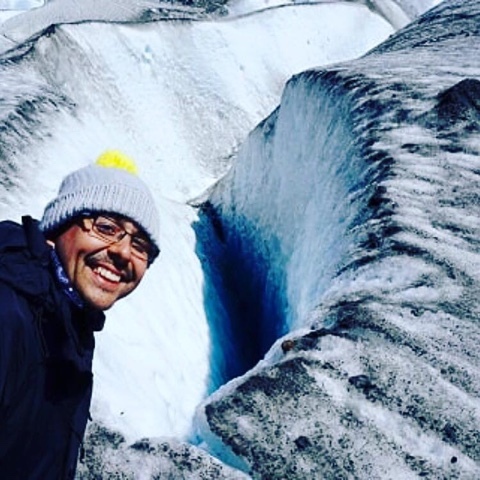 We are still following our son's adventure in South America and look forward to his Skype messages about once a fortnight and he is posting hundreds of photos to the cloud so we can see what they have been doing. 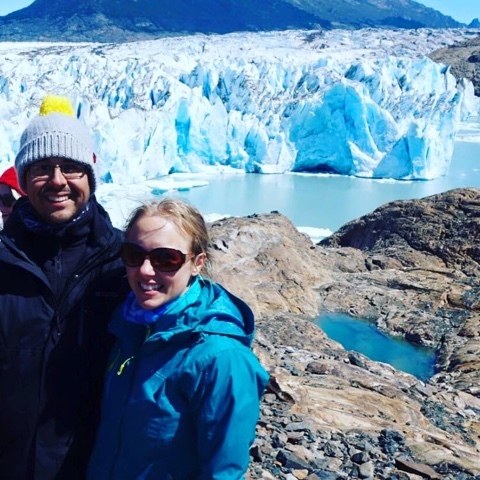 They are in Patagonia and have seen some wonderful sites treking on glaciers and visiting waterfalls. 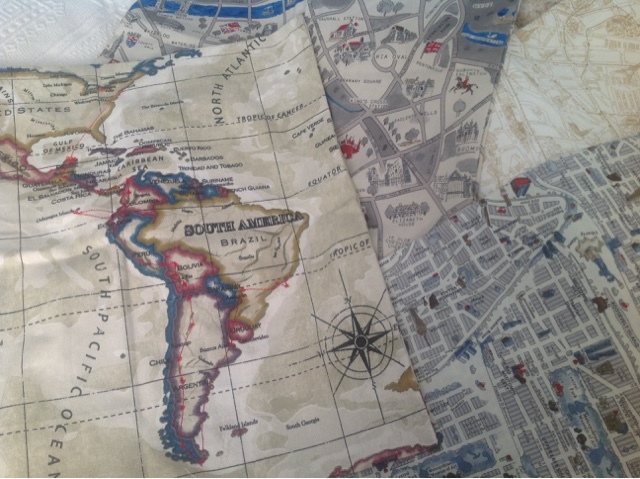 They are about to move further north into Chile and Peru and then will be doing the Inca trai. 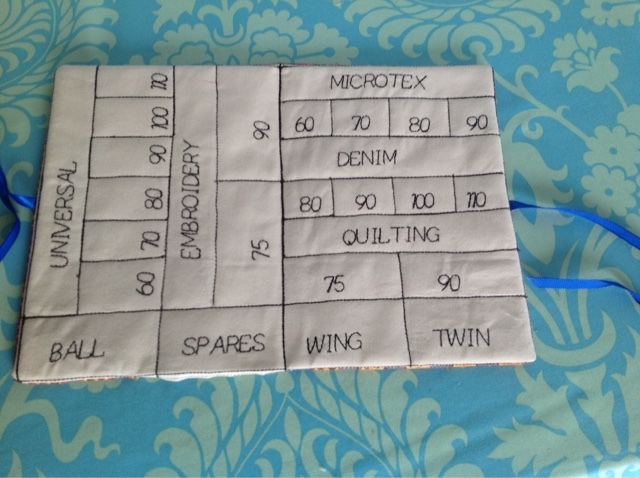 So I need to get back to the embroidery machine and get these blocks done and also do the next part of the Craftsy BOM. Happy New Year - well nearly!! It will be the new year in a few hours time and I wanted to get my final finish of the year posted after delivering it to my daughter and son- in- law today. It was meant to be a surprise present from me for Xmas day but I did not get the borders finished so I am pleased I managed to get it done today. So now I can start the 2016 projects! 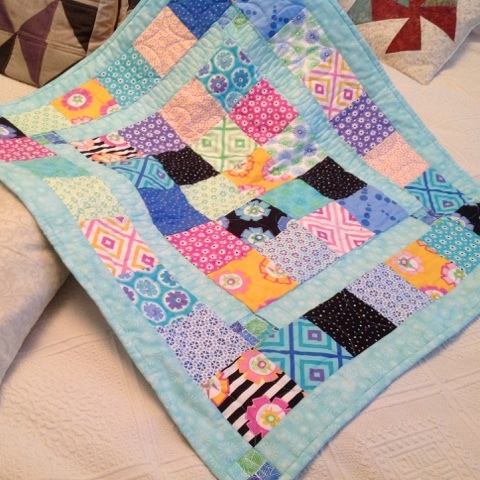 I can get carried away at this time and sign up for quilt alongs and swaps and this year is no exception ! I have already signed up for Lori Holts "Bloom " quilt sew along which is a monthly block and have already bought the templates as this an applique quilt which I have wanted to do for a while. The other sign up is to the 365 Quilt Long - a block a day for a whole year! 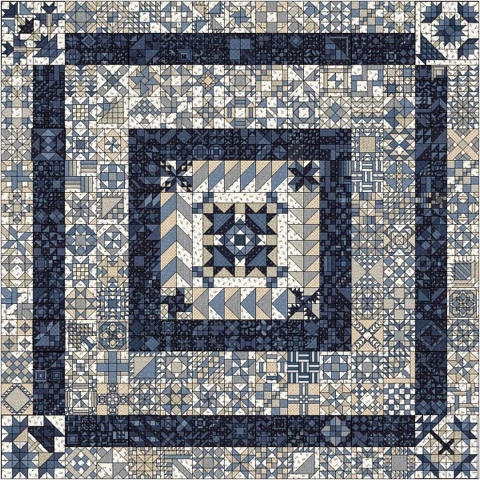 I was attracted to it as the example is done in Civil War blue/ Browns which I love but already the first two blocks are causing me problems. The finished block size ranges from 3 to 6 inches and the first two are 3 inches per block. One of mine has finished a bit over so I will have to have another go at it. So I'll see how I go with it. My reason for signing up is to keep me busy! My son and his wife left for a six month trip to South America, Central America, USA and Canada on Tuesday. It will be a wonderful experience for them as they travel up through Brasil, Argentina, Peru, Bolivia, Equador, Panama into California and then up to Canada but worrying for me at this end!!! So a happy new year to everyone !!! 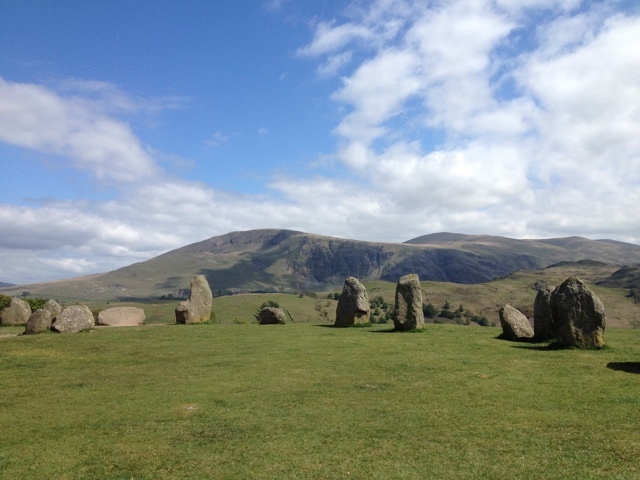 I will always reply to your comments -either through my blog or by email. Thanks for stopping by.